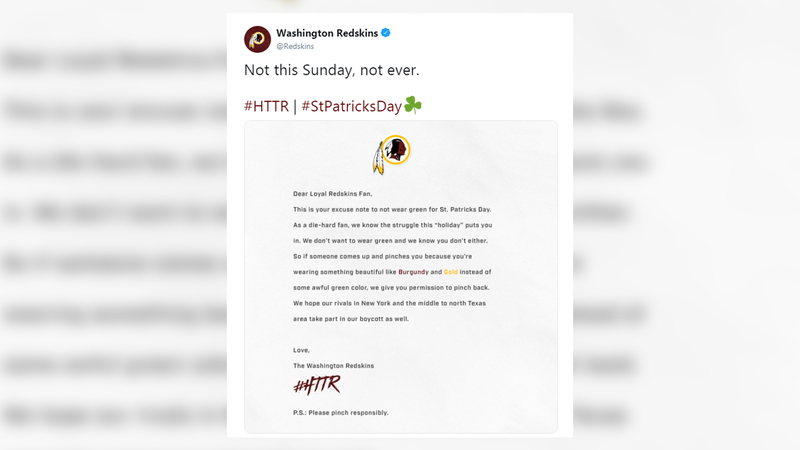 PHILADELPHIA (WPVI) -- The Washington Redskins are trolling the Philadelphia Eagles on this St. Patrick's Day. "This is your excuse to not wear green for St. Patrick's Day. As a die-hard fan, we know the struggle this 'holiday' puts you in. We don't want to wear green and we know you don't either," the Redskins said in a letter to fans. The organization recommended wearing different colors. "So if someone comes up and pinches you because you're wearing something beautiful like Burgundy and Gold instead of some awful green color, we give you permission to pinch back," the letter continued. The Redskins also encouraged our co-NFC East teams to take part in the boycott. "We hope our rivals in New York and the middle to north Texas area take part in our boycott as well."